Well, contrary to my own expectations, I’ve finished this in time for German Lit Month! Doctor Faustus (1947) was the last novel of Thomas Mann, (1875-1955) and it’s considered to be his masterwork. It’s the third novel I’ve read by this author, the others being Buddenbrooks (1901) and The Magic Mountain (1924), both written before Mann was awarded the Nobel Prize in 1929 (which was cited principally for his great novel, Buddenbrooks, which has won steadily increased recognition as one of the classic works of contemporary literature. How little they knew what a truly great writer he was to become!) 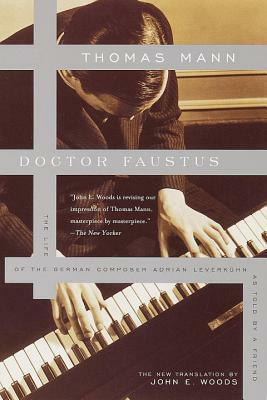 This translation of Doctor Faustus by John E. Woods became available in 1999, and one can only wonder at the skill of the translator in this case: the novel is so rich and complex and dynamic, even without knowing a word of German I can see how difficult the task must have been to convey the tone of the narrator Dr Serenus Zeitblom. This tone, for all its fussiness and pedantry, is central to understanding Mann’s lament for a deep and powerful loss. Published in 1947 in the aftermath of Germany’s infamy being revealed in all its horror, Doctor Faustus: The Life of the German Composer Adrian Leverkühn, Told by a Friend is a lament not just for the nation state that was brought so low by its own ideology, but also for the idea of Germany as a place of civilisation and culture. It is a lament for the boyhood days of innocence before World War I; a lament for the suffering under reparations that Germany brought on itself by its barbarity while pursuing grandiose plans of conquest; and a lament for the ease with which Nazism was embraced by a people who ought to have resisted it. As WWII closes in and the Fatherland is in ruins, Mann from his exile in America shows us his narrator rue the destruction of the cities while acknowledging that there is justice in the brutality of the Allied air campaign. the reader’s time: which is the 21st century for me and others who will read this book in the future, and an indeterminate post-1947 past for readers who’ve come to this book before my reading of it in 2016. But for the author, Mann, it’s some indeterminate time in any future. Like the fussy old schoolmaster he is, Zeitblom reminds his readers not to skip chunks of text that seem difficult (like in the in-depth analyses of a Beethoven sonata, for example) because understanding them is integral to understanding the story. At page 89 I decided to take his advice and went back to the beginning of the book and re-read it, making copious notes as I went, a strategy that I continued for all but the last 100 pages. Reading it like this – about 20-30 pages at a time – made me very aware of the richness of the text. It’s not a book for a dilettante. It’s 500+ pages of densely packed text in long paragraphs, delivered in the pedantic, often ponderous style of the retired schoolmaster, forever qualifying his thoughts, deliberating over his reservations, expressing his horror at his friend’s corruption and digressing on the one hand into very long and complex analyses of the music that Adrian composes, and on the other into his anxiety about the encroaching defeat and also his own fitness to tell the story. The reader cannot help feeling empathy for this character, alert to the possibility that his magnum opus must be kept secret because of its subversive commentary about the Nazis, and afraid that his own sons might denounce him to the Gestapo. For all his self-delusions about his one-sided friendship with, and protective attitude towards Leverkühn, he seems to be a man of integrity, resigning from his teaching position when he was politically compromised, and distraught about the death of humanity in his homeland. Almost every other page has symbolic meanings and allusions either to music, literature, theology and philosophy. At one stage I found myself googling Dürer’s woodcuts of the Apocalypse, and I toyed with the idea of side-reading not only Goëthe’s Faust, but also Revelations, Dante’s Inferno and Love’s Labour’s Lost. Yes, I am going to re-read Doctor Faustus after I have tackled these texts… I am only too well aware that these are preliminary thoughts, much like those I had the first time I read James Joyce’s Ulysses – and like that book, Doctor Faustus will be enhanced by pausing to track down the musical allusions as well. That will mean listening to Schoënberg as well, not my favourite composer, but – acknowledged in an author’s note at the back of the book – Schoënberg was the model not for the character of Adrian Leverkühn, but for the twelve-tone music he composes. Apparently Schoënberg was not best pleased about being associated with a character who’s in league with the Devil, but hey, hang out with authors, what can you expect? (Bertrand Russell said this much more elegantly, but I can’t find the quotation right now). Schoënberg would not have liked the implication that Leverkühn takes the development of music to the point where the beautiful harmonies of the past are redundant and composition is subject to rigid structural rules, complex and clever but – crucially – not humane. In Mann’s novel Leverkühn achieves this through his pact with the Devil, either ‘literally’ in a symbolic reversion to Medieval ‘volk’ ideas about Christianity when the Devil was ‘real’ and represented the antithesis of all that was good, holy, pure and humane; or, as a hallucinatory symptom of the madness of venereal disease which Leverkühn picked up from a prostitute called Esmerelda. Either way, abandoning and scorning the humane symbolises Germany’s tragic adoption of superficially attractive populism and demagoguery. The allegory of the Third Reich: the loss of humanity in favour of pure rationality i.e. Adrian’s move from religion (when he abandons his study of theology) to the study and elevation of the music of integral serialism. This is like the German shift away from an intellectual elite dominated by humanism to the efficient calculation of he Nazi Party in their ruthless elimination of anything that was in their way. The critique of bourgeois society – revealing the hypocrisy and complacency about the Nazis. In the musical salons that he depicts (especially in Munich) Mann shows the bourgeois making claims for a sophistication and culture that should have alerted them early to the danger of Hitler. The narrator Zeitblom doesn’t recognise danger either. While he has some grasp of Adrian’s corruption, he doesn’t quite believe it because it seems so impossible. Zeitblom fatally turns a blind eye, distracted by social events and awed by Adrian’s genius. He misjudges Adrian in the same way that the nation misjudges Hitler until it’s too late. (And if this doesn’t make you think of Donald Trump, you haven’t been paying attention). The exploration of the German character of Art and Novel through the life of an artist. Mann depicts the fear of creative sterility and the suffering and isolation of genius. These three strands of the novel are interpreted for the reader by the childhood friend who is wilfully blind (as Germany was) to the appalling faults of his subject: arrogance, isolationism born of a sense of superiority, scorn for others, delusions of grandeur, (again, like Germany was). Perhaps in his depiction of Zeitblom Mann is also judging himself as a critic from afar, watching, observing, expressing grave reservations, but since he was not speaking out face-to-face at the critical moment to the one at fault, he was ultimately impotent. Whatever about that (and I have said that these are preliminary thoughts), there is no doubt that for someone who loved his homeland, its civilisation and its culture as Mann did, the tragedy of the Third Reich was a source of profound grief to him. Without any diminution of my feelings about the Holocaust, and on a personal level about World War II and its impact on my family, I found Mann’s grief poignant, and the expression of it in that era, heroic. Intrigued by what the Modernism Lab had to say about immediate critical reception of the novel, I found a review from 1948 which panned Doctor Faustus for turgid prose, and one from 1975 saying it was written in the wrong century because people don’t believe in the Devil any more. He also thought it was anti-German. Well, leaving aside the critic’s failure to recognise modernism under his nose, that’s mostly true about the Devil, but people certainly do believe in the existence of evil. But as for being anti-German? The whole world was probably anti-German in 1948, but it seems to me now that Mann was (justifiably) opposed to the Germany that was, and would probably be proud of what Germany has now become, a leader in the Western world for its humane treatment of Syrian refugees and a moral beacon when it comes to leading the fight against anti-Semitism and racism. Google located some reviews that begin by saying how difficult this book is, and how you need to have specialist knowledge to undertake reading Doctor Faustus. But I don’t think so. Of course some elements escaped me even on my second reading; I took three weeks to read it and I could have taken longer if I investigated everything that intrigued me. But like this reviewer (who doubts his own understanding) I can be content with what I have gleaned from it, with whatever limitations that entails. I feel like a wiser person because I read it. Unlike the cautious reviewer, I do want to read it again, but not before I’ve read the books that Mann alludes to. (I was always going to read them anyway, and Mann just provides another impetus). And if you read this review (which is much better than mine, but likewise written by someone who’s not an ‘expert’) you may well feel that you too can tackle one of the most important books of the 20th century. Available from everywhere probably, but I bought mine from Fishpond: Doctor Faustus for about $20AUD. This is one I haven’t read, surprisingly. No time this year, but I definitely intend to return to Mann at some point. I have to read some Thomas Mann. I love his brother’s work, and I have a sneaking suspicion that I’ll prefer Heinrich over Thomas. I read a very interesting article about the brothers. They were not much alike. In real life, I would have preferred Heinrich too, I think. I read Blue Angel (there’s a film w/Marlene Dietrich in her first screen role–one of my favourite films) and Man of Straw (republished in many different titles). Most of his stuff has fallen out of print. I’ve been slaving away all day on Christina Stead. She read The Magic Mountain in Paris in 1929, and Ulysses too, and wrote that Joyce considered Mann the greatest living writer. Well, The Magic Mountain is an amazing book. I’ve only read it once and I know I missed a million things, but I thought it was brilliant. I’ve started Seven Poor Men of Sydney. I can see it’s going to make me think! Terrific review, Lisa. I loved this when I read it. Has Mann’s book on Dr Faustus also been translated into English? If so, you’d love it. It gives such a lot of background information. In English, the book is The Story of a Novel: The Genesis of Doctor Faustus. Any excuse to look at Dürer woodcuts is a good excuse. Yes, they are lovely… well, lovely is not the right word, they are captivating. I’d love to see them in situ, wherever they are…. So it has been translated. That’s great because it really adds depth to the novel. Dürer, yes. Always a reason. That’s great… I love it when my ramblings encourage people to read books that I’ve liked… you’ve made my day! Very interesting musings, Lisa, and I also like the links and comparisons you have included. I found Dr F heavy going, but your post has elucidated several aspects of it that I missed. It’s worth persevering with, despite its difficulty. Must say I preferred Magic Mountain, but that says more about my laziness than the merits of the two novels. Great review. I agree, bits of it are heavy going. I have a background in music but I don’t know anything much about atonal music (basically because I don’t like it and don’t listen to it) so I found those bits a bit of a struggle.